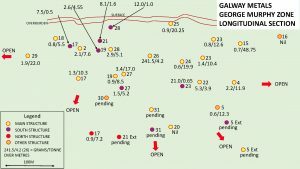 Galway Metals Intersects Wide, Near Surface Mineralization at its New GMZ Discovery at Clarence Stream in New Brunswick - Galway Metals Inc.
assay results from 5 additional drill holes and 2 partial holes, (1,693 metres) in the recently discovered George Murphy Zone (GMZ) at Clarence Stream in SW New Brunswick (Figure 1). 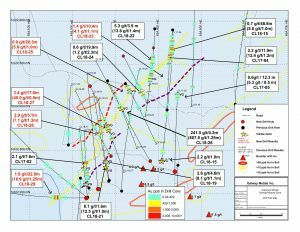 A new intersect from hole GWM-18CL-29, which returned 1.9 g/t gold over 22.0 metres, extended the strike length of the GMZ by 110 metres to 500 metres. The drill program is designed to expand the mineralized envelope in order to complete a resource update, which will be undertaken in the first quarter, 2019. The upcoming Clarence Stream resource estimate will include, for the first time, the newly discovered George Murphy Zone and the Jubilee Zone. “This 500-metre long new discovery is filling in and expanding nicely, and continues to be open in every direction. Galway believes its huge, 60,000-hectare, 65-km long Clarence Stream property hosts a new emerging gold district. 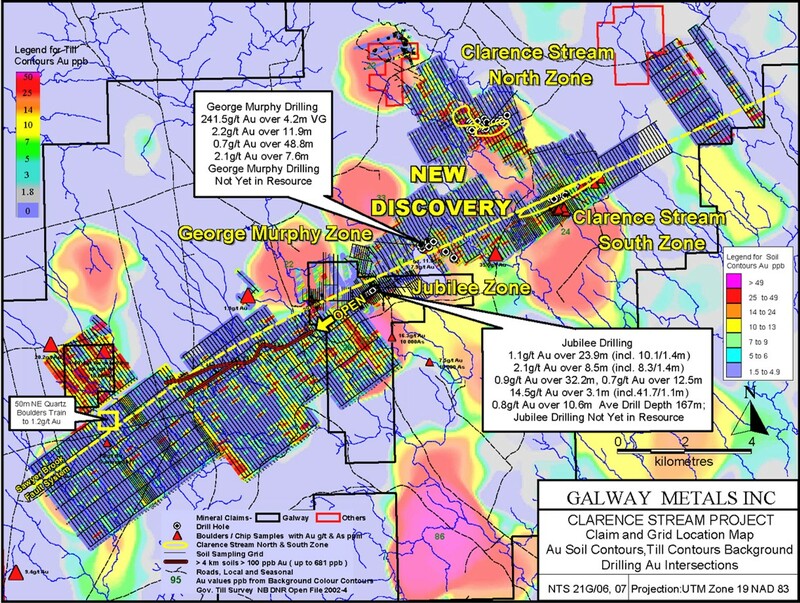 In fact, the discovery at George Murphy represented Galway’s first drilling outside the three previously known deposits, and given the plethora of additional drill targets that exist, additional discoveries are likely ahead. Galway set an exploration target of 200,000-260,000 ounces for George Murphy,” cites Robert Hinchcliffe, President and CEO of Galway Metals. 3.4 g/t Au over 17.0 metres (m) (8.9m true width (TW)) at a vertical depth of 101 m below surface, (including 40.0 g/t Au over 0.5 m, and 24.3 g/t Au over 1.0 m), in GWM-18CL-27. 2.9 g/t Au over 5.1 m (4.1 m TW) at a vertical depth of 60 m below surface, (including 7.1 g/t Au over 1.3 m), plus 12.0 g/t Au over 1.0 m, in GWM-18CL-28. 1.9 g/t Au over 22.0 m (16.2 m TW) at a vertical depth of 62 m below surface, (including 16.9 g/t Au over 1.3 m), in GWM-18CL-29. 1.4 g/t Au over 10.4 m (4.7 m TW) at a vertical depth of 58 m below surface, (including 5.0 g/t Au over 0.5 m, 4.1 g/t Au over 1.1 m, and 3.6 g/t Au over 1.0 m), plus 0.8 g/t Au over 12.6 m (5.7 m TW) at a vertical depth of 22 m below surface, (including 5.8 g/t Au over 1.0 m), plus 3.2 g/t Au over 2.2 m (1.0 m TW) at a vertical depth of 97 m below surface, plus 21.0 g/t Au over 0.7m (0.3 m TW) at a vertical depth of 121 m below surface, in GWM-18CL-23. 0.6 g/t Au over 19.9 m (10.7 m TW) at a vertical depth of 85m below surface, (including 1.6 g/t Au over 1.5 m), in GWM-18CL-24. 0.9 g/t Au over 20.3 m (10.9 m TW) at a vertical depth of 7 m below surface, (including 5.8 g/t Au over 1.0 m, 2.1 g/t Au over 1.4 m, and 3.0 g/t Au over 1.1 m), in GWM-18CL-25. Looking ahead, Galway plans to drill exploratory holes on one of its far-east properties. The next target for resource expansion drilling is the Jubilee Zone (not currently in resource), which is open in every direction. As part of this effort, a 4 km-long linear soil anomaly will be drilled. It is 2.5 km to 6.7 km along strike west of Jubilee and contains 11 samples greater than 100 ppb gold, with the highest at 681 ppb. For comparison, 10 ppb is considered very anomalous (the highest soil sample in the GMZ is 86 ppb). The GMZ is located 2 km east of the Jubilee Zone and 4 km west of the South Zone (Figure 2). The most recent press release on Clarence Stream contained an intersection of 807.0 g/t Au over 1.25m from hole GWM18CL-26 (within an intersect that graded 241.5 g/t Au over 4.2m), which Galway showed contained Visible Gold (VG) (VG Photos) that is located at the centre of what was previously a 300-metre gap between the two lines of drilling where the original discoveries were made. This latest round of drill results represents step-outs, both to the west/southwest and to the east/northeast, from the 807.0 g/t Au intersect in hole 26 at the centre of the deposit (Figure 3). To the west/southwest were new intersects such as 3.4 g/t Au over 17.0m, 2.9 g/t Au over 5.1m, 12.0 g/t Au over 1.0m, and 1.9 g/t Au over 22.0m. These are located from 63m to 255m west/southwest of the 807.0 g/t Au intersect, with the last one noted above representing a 110m extension from the previous western edge of the deposit where 2.1 g/t Au over 7.6m and 1.3 g/t Au over 10.3m were returned. The GMZ strike length now extends 500m. The intersection of 12.0 g/t Au over 1.0m appears to be part of another zone located to the south. New results to the east/northeast included intersects such as 0.9 g/t Au over 20.3m, 0.6g/t over 19.9m, 21.0 g/t Au over 0.7m, 1.4 g/t Au over 10.4m, 3.2 g/t Au over 2.2m, and 0.8 g/t Au over 12.6m. The latter four intersects were from hole GWM18CL-23 as it intersected multiple mineralized structures. These are located from 77m to 141m east/northeast of the 807.0 g/t Au intersect and fills in a gap in drilling from the eastern-most fence of holes in the GMZ, where 2.2 g/t Au over 11.9m and 0.7 g/t Au over 48.8m were returned. The GMZ remains open in all directions. Based on closely spaced drill holes on the east and west ends of the deposit, the zones appear to dip steeply to the south. The current interpretation may be subject to change; a small roll in the Main zone strike may be due to a fold, a fault offset, or there may be separate zones. The new GMZ discovery was found by drilling in the immediate vicinity of a 700m long soil anomaly where boulders, which assayed 16.5 g/t, 11.5 g/t and 7.9 g/t Au were found by prospector George Murphy. These boulders are 100-300m south of the GMZ, and like the North Zone, the GMZ is located north of the major structure in the area—the Sawyer Brook Fault. The South and Jubilee Zones are located south of the Sawyer Brook Fault. Hence, gold deposits are hosted on both sides of the fault zone. Within the GMZ, there appear to be multiple veins that trend in the same NE-SW direction as the Jubilee and South Zones (Figure 1). Figure 2 shows the location of the new GMZ discovery relative to other zones. Figure 2 also shows that there are many geochemical gold anomalies similar to the GMZ, Jubilee, and the South and North Zones, which Galway plans on drilling. Prior to receiving the assay results reported in this press release, Galway had set 200,000-260,000 ounces as an exploration target for the George Murphy Zone. Parameters used in arriving at this target was that mineralization would be hosted within a 400m length by 400m depth area and consist of a 10m average width zone at 2.0 g/t from surface to 150m, and a 3m wide zone at 5.0 g/t below 150m. This was based on the first intersections received, and the presence of wide zones of quartz where narrower, higher-grade intersections have been received. The potential quantity and grade is conceptual in nature. There is insufficient exploration to define a mineral resource; it is uncertain if a mineral resource estimate will be delineated. 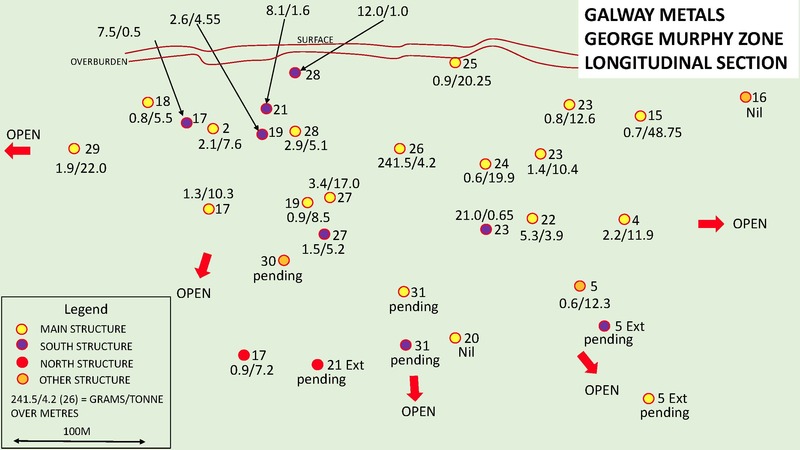 Galway’s drill results reported to date at Clarence Stream total 24,575 metres in 119 holes (~80,000 metres by all operators have been drilled at Clarence Stream), including 4,782 metres in 29 holes at the George Murphy Zone (of which 9 holes of 2,306m were drilled south of the discovery). 24.0 24.7 0.6 0.4 0.3 V.G. incl 141.0 142.0 1.0 0.5 24.3 V.G. incl 156.8 157.3 0.5 0.3 40.0 V.G. VG = visible gold. 0.42 g/t Au was used for the bottom cut-off; VG in hole 26 was assayed by metallic screens method (856.0 g/t Au by Fire Assay). The blank sample following the 807.0 g/t assay ran anomalously for gold and the samples that followed (also part of the quartz zone) will be re-assayed but will not materially change the results. Holes GWM17CL-06 and 08 to 14 were drilled south of the discovery to check for the presence of the South Zone, which is south of the Sawyer Brook Fault. True widths are unknown where not specified. 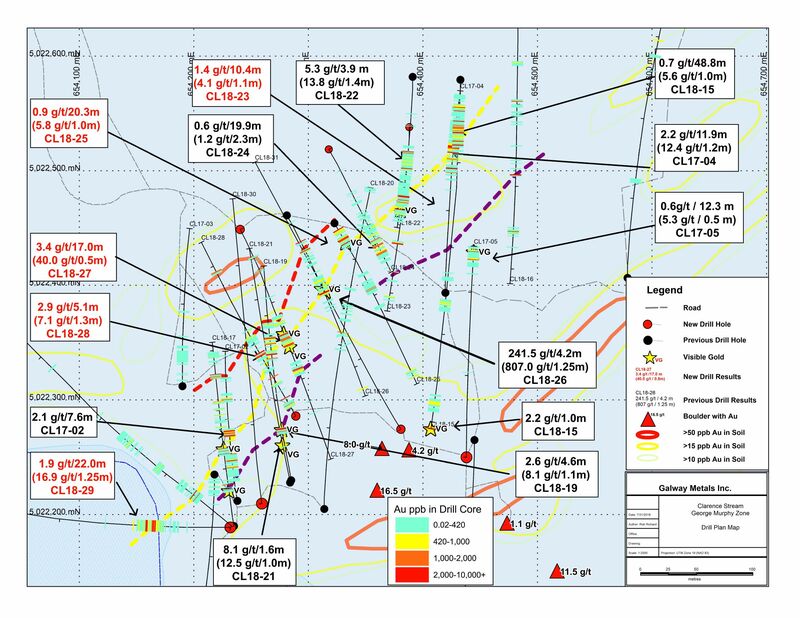 The VG in hole 26, the 13.8 g/t in hole 22, and the 12.4 g/t in hole 4 all look like they are along the southern contact of a wide quartz zone. The mineralization consists of 10-70% quartz stockworks and veins with 1-5% fine pyrite plus pyrrhotite plus arsenopyrite in sericite altered sediments. A more complete description of Clarence Stream’s geology and mineralization can be found at www.galwaymetalsinc.com. Galway would like to acknowledge financial support from the New Brunswick Junior Mining Assistance Program, which funded parts of the drilling of the GMZ. For holes 1-29 see the full George Murphy Zone Drill Hole Results Table.